Microsoft Active Directory (AD) is great for managing Microsoft tools. But in the age of virtualization, cloud, and mobility, you need best-in-class DNS and DHCP management utilities for core network services. That’s why 1000’s of network teams have added Infoblox DNS, DHCP, and IP address management (DDI) to their Microsoft environment. By doing so, they enhance the availability, manageability, security, and efficiency of their networks. Read this white paper to learn how adding Infoblox DDI to your Microsoft environment can improve visibility and management of DNS, DHCP, and IPAM processes. In addition, beef up your security and enhance reporting while automating your network for virtualization and cloud. Transform your Microsoft environment into a best-of-breed DDI solution—without any changes to your Microsoft AD by implementing Infoblox. 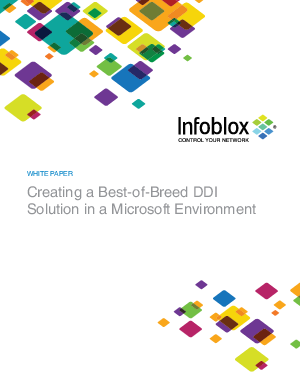 Read this white paper today and get ready to gain the benefits of best-of-breed DDI management.